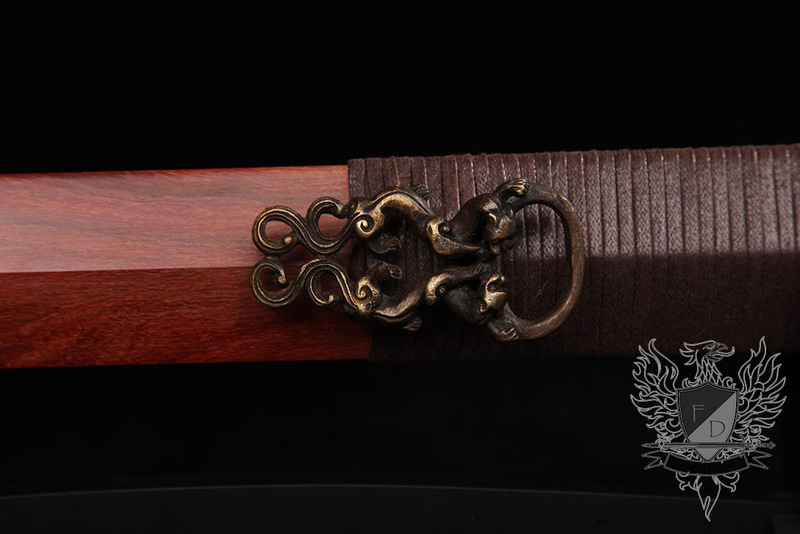 The Early Han Red Ebony Jian is a unique style of sword from the early to middle Han period (approx 206BC to 1AD) and features a distinctive ring pommel that was common throughout this period and were among the first steel swords used in China. This particular model features a folded 1095 carbon steel blade, sharpened on both sides yet with a traditional single sided cutting tip, creating a very versatile and effective blade that can be used to both cut and thrust with amazing precision. 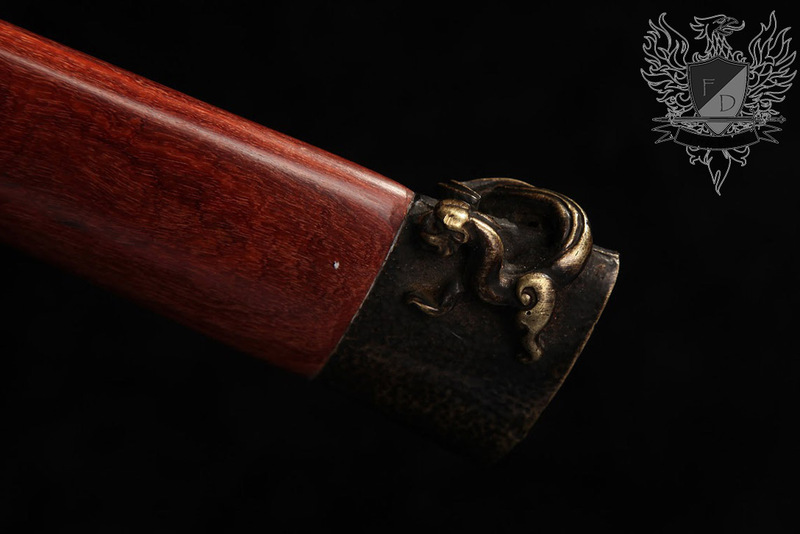 Fittings are made from high quality brass featuring a traditional dragon theme, wrapped with a utilitarian and attractive leather braid on the handle and set off with a vividly colored natural Red Ebony sheathe. 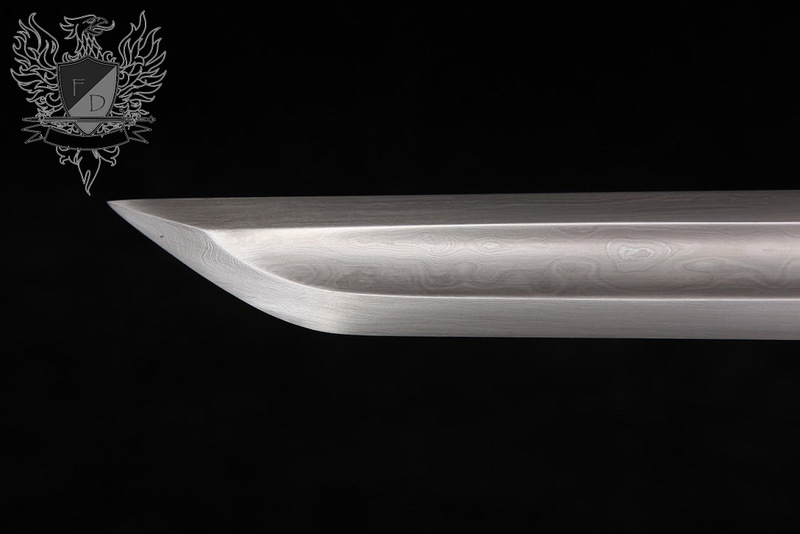 Master Smith Hand Forged, FOLDED and Sharpened 1095 carbon steel blade. 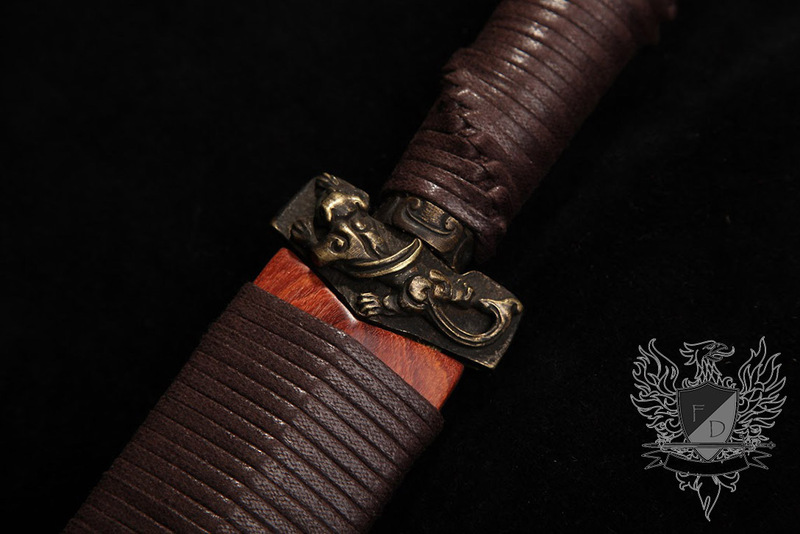 Red Ebony Scabbard and Handle with intricate traditional leather wrapping. 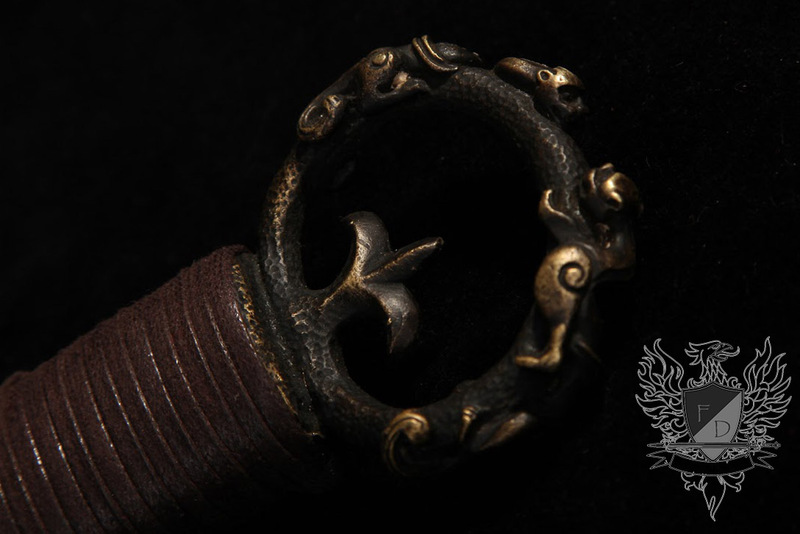 Solid Brass fittings with traditional assembly. 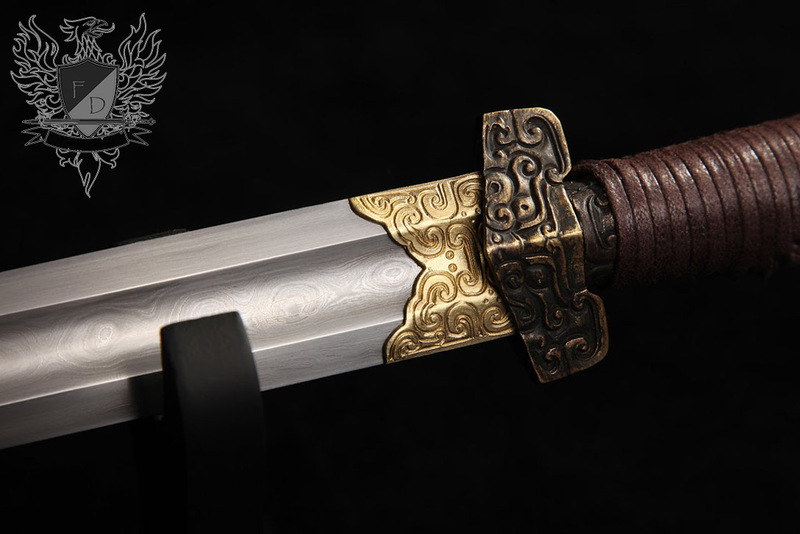 You have to handle this sword in person to appreciate its quality. 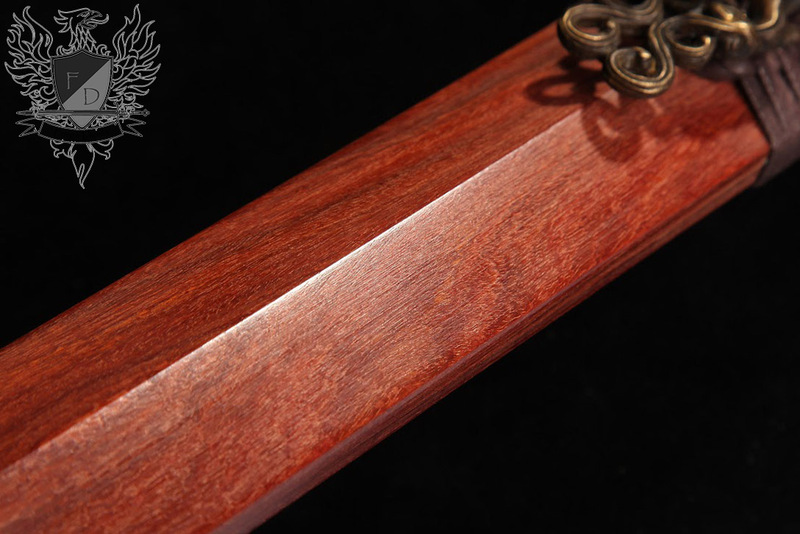 Fit and finish are outstanding, balance is perfect with a forward grip. 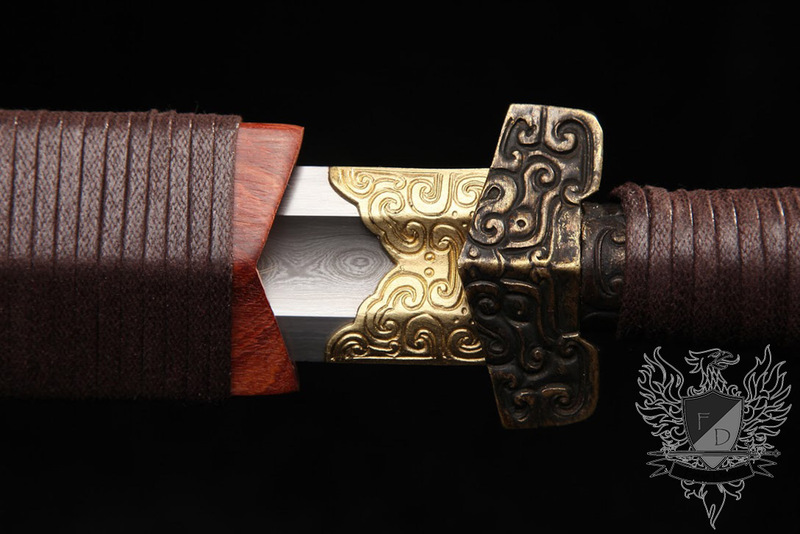 As great as the photos are, they do not do the beauty of the blade justice...the intricate pattern of the steel is mesmerizing, and the lines of the blade are flawless. 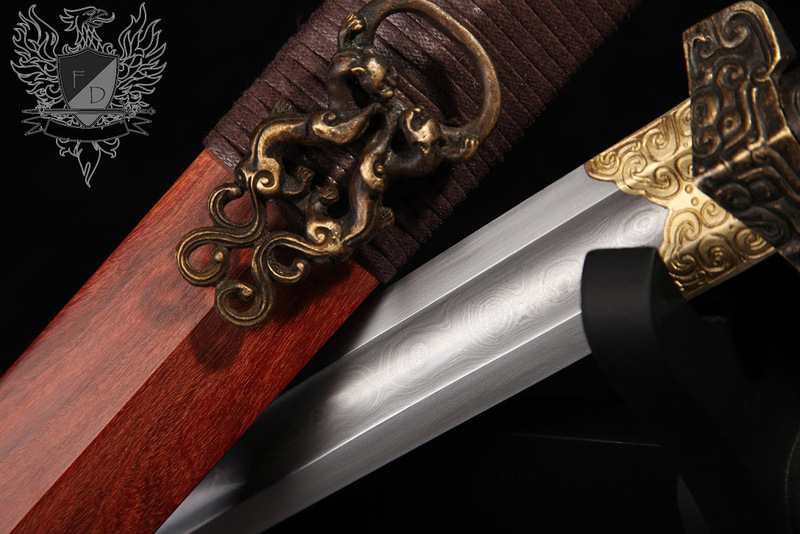 The leather wrapping on the handle and scabbard is tight, even, and secure, and the unique ring pommel is intriguing. 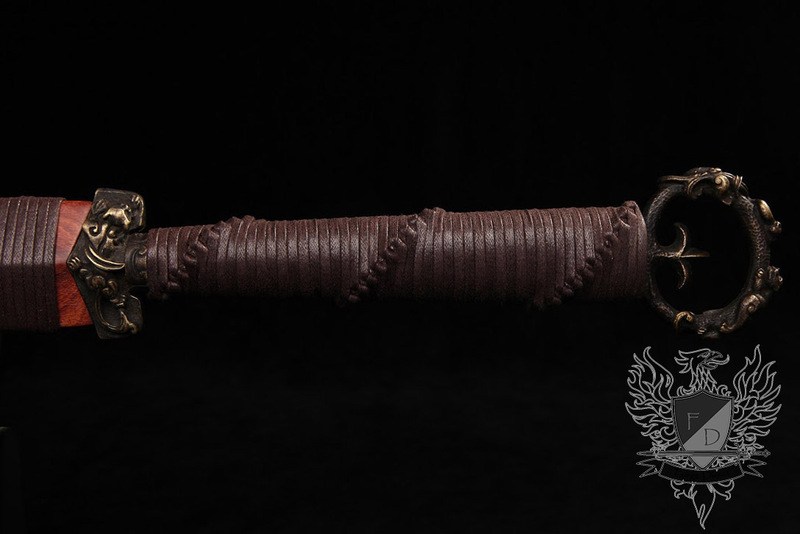 Bronze fittings are well cast. 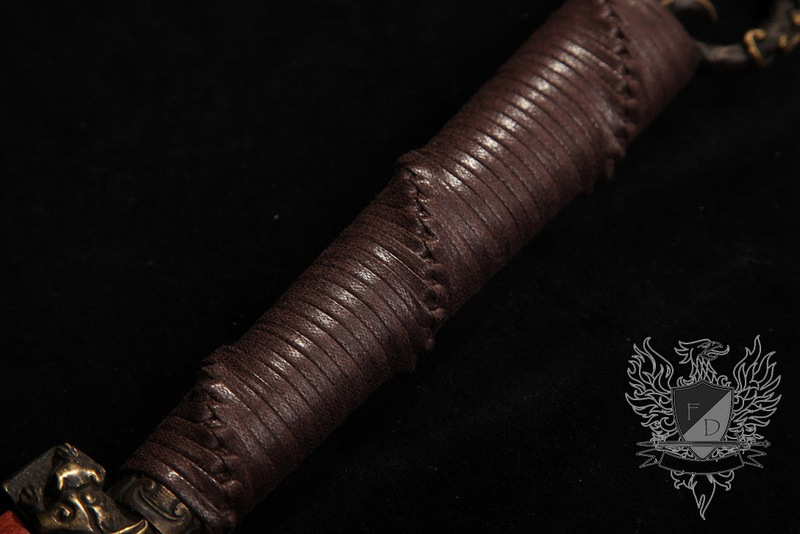 The wood sheath is smooth, well fitted, and finished nicely. 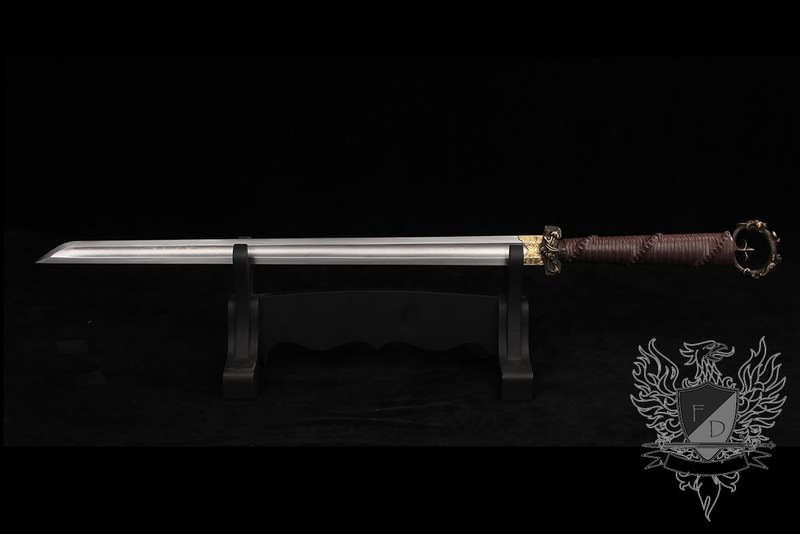 I had wanted this sword for some time; after receiving it, I wish I had purchased it sooner. 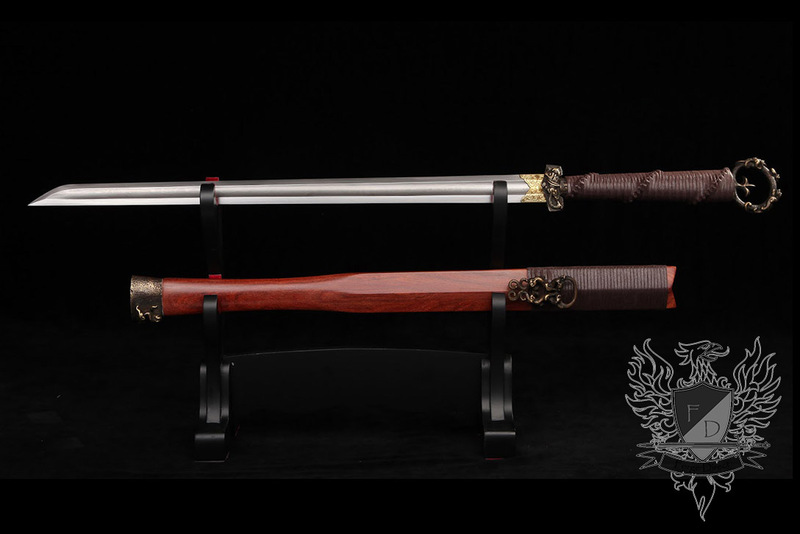 Other sellers sell similar swords--DO NOT PURCHASE THEM!! 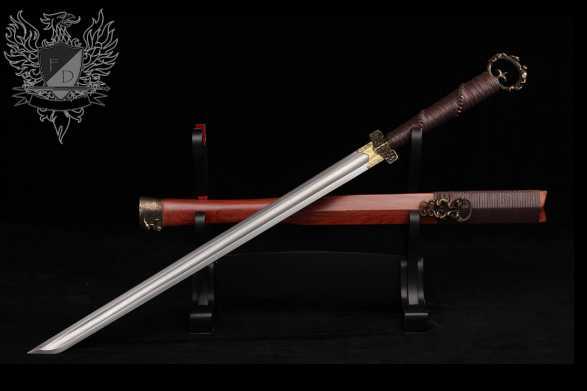 They do not compare to the quality of Sword Buyer's Guide's swords. 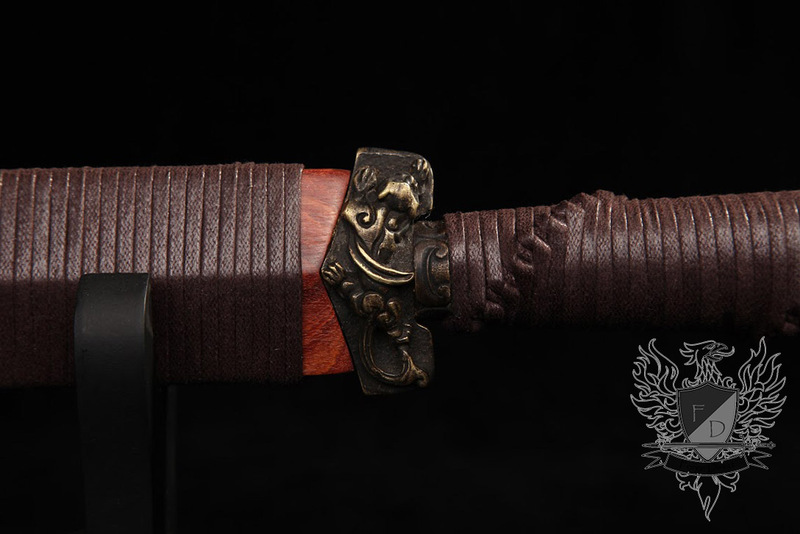 SBG's Early Han Dynasty Red Ebony Jian is a beautiful, high-quality, and fully-functional sword, ready for museum-quality display or practice. 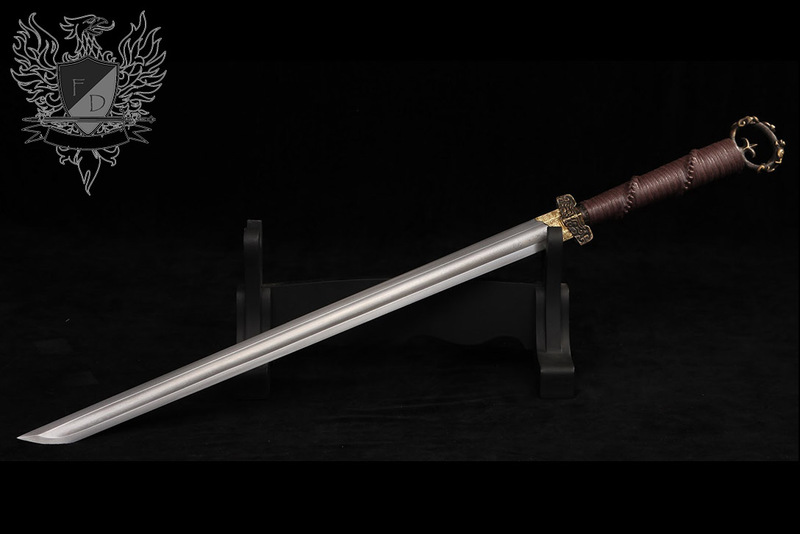 I have purchased from SBG previously, and will do so again. For quality, dependability, and customer service SBG can't be beat--they stand behind every product they sell and offer a lifetime guarantee.